New designer 2 bed contemporary cottage with sunrise to sunset views. 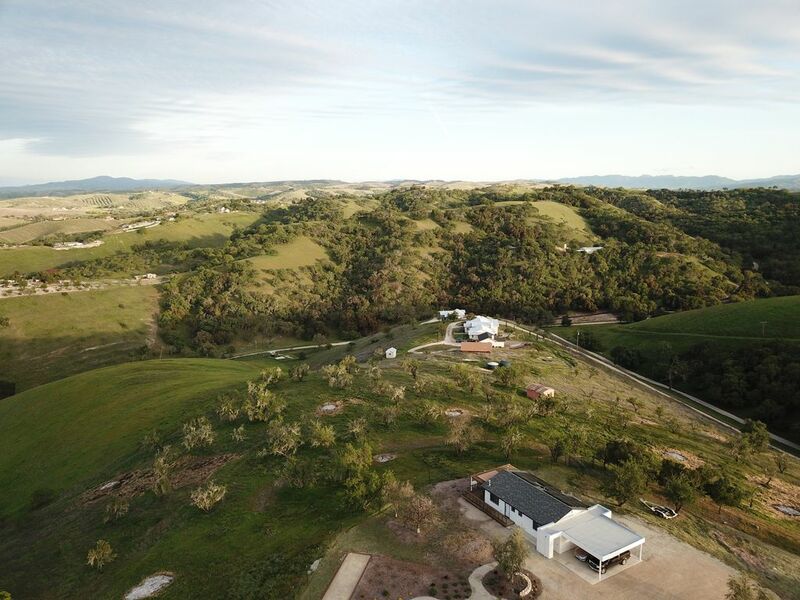 A newly built contemporary cottage sitting atop a 12 acre property with 360 degree views of the beautiful and bountiful wine growing and ranching region of The California Central Coast. A large deck for outdoor dining, drinking and contemplating. A spacious open plan sitting, dining and chef's kitchen with a warm gas fire inside and more of those panoramic views outside. Ideal for communing, chilling and feasting. Two spacious double bedrooms with high quality queen beds and linens and a European bathroom complete with a large walk in rain-head shower. There is also a comfy couch ideal for children in the lounge. Perfect for resting and refreshing. A bocce ball court with a view to die for, and miles of trails if you are feeling energetic. All this only 12 minutes off the 101, within a 30 minute drive of 300 wineries, and no more than a 15 minute drive to the bars, restaurants and shopping of Paso Robles, Templeton and Atascadero. Our new cottage is designed for couples or a family and comfortably sleeps 4. It has every thing you need for a memorable stay on the central coast, for a weekend, a week or a month. Our fully equipped chef's kitchen comes with everything you need to enjoy meals at home, and the outside BBQ might have one of the best views of any BBQ in California. The home is a contemporary design reflecting the owners' international travels and has all the comforts of home including high quality bed linen, towels, bathroom supplies, hair dryer and plenty of wardrobe space. Super efficient heating & a/c. A gas fire. Filtered water. High speed WiFi on a property that is to all intents and purposes 'off the grid' and self-sufficient. We try to keep our environmental footprint to a minimum. We live on the property, and will welcome you with a package of local delicacies along with a native's knowledge of things to do in the area. Let us know if its beach, mountains, towns, wineries, trails, riding, shopping, dining, drinking you are looking to indulge in. We're confident we can give you great local recommendations and we have also arranged some special packages with local wineries, olive oil producers and coffee roasters. We are lucky enough to have lived all over the world, and chose to return here as the closest place to paradise for modern living that we can find. The fact that one of us was born here didn't hurt either! Please feel free to call if you have any questions, or email. We're confident our rates are the best value for money in the area, and we'll do whatever we can to make sure you enjoy your visit as much as we love living here. We were born on the Central Coast of California and the West Coast of Africa. We have lived to travel, funded by successful careers in entertainment, technology and healthcare. We are happiest among friends in exotic places, enjoying the epicurean delights of great food, wine and conversation. Our goal has always been to build homes around the idea of open plan open air living in places that we love. After building a beach home on the island Zanzibar off the East Coast of Africa, we turned our attention to building our dream home back home where Karrin was born. Kuona Villas is that dream come true. We designed and built the homes on the property ourselves. The cottage is based on all the features and home comforts we look for when renting our own holiday villas. We are lucky enough to have lived and traveled around the world, from Europe through Africa. Big cities, country villages and golden sandy beaches. Yet chose to return here because of the unique combination of great weather, world class vineyards and ranches, one of the most famous coastlines in the world, easy access by car and plane and wonderful shops and restaurants. Not included: Noise; Mini-bars, Schedules, Lowered Voices, Strangers, Apologizing. Included: Peace & Quiet, Space, Freedom, Flexibility, Conviviality, Loved Ones, Great Memories. The first thing you'll notice as you drive up the lane is the tranquility. Then you'll be immersed in a 360 degree view of rolling hills, vineyards and ranches. (Kuona means 'To See' in Swahili, the language of Zanzibar and East Africa). As we welcome you with a glass of wine, a pot of tea (the English are never far from a cuppa) or freshly roasted coffee from our coffee shop, you'll be struck by the warm, contemporary interior design and all the comforts of home. That includes a welcome pack from some of our favorite producers in the area including wine, discounted wine tastings, olive oil, freshly roasted coffee and amazing honey from bees who feast on a coastal avocado farm. We offer a 'Concierge Service' including private wine tours with driver, reservations at local restaurants and a driver for evenings out. We have friends at vineyards and olive farms and ranches around the area. That means 'mates rates' on everything from wine and wine tastings, olive oil, honey and coffee. Right next door is a world famous natural wine vineyard where you can get a free wine tasting of one of the purest and most natural expressions of wine you will ever taste. Just down the road is an amazing organic fruit and vegetable farm. We love living here and enjoying all the world class natural produce that the Central Coast has to offer. We'll make sure you get the locals knowledge and the local deals. toilet, shower, European fittings with large walk-in rain shower. Organic bath amenities - soap, shampoo, conditioner, body lotion. 360 degree sunset to sunrise views of vineyards and ranches. Fully equipped chefs kitchen. Oven, Range, Microwave, Coffee machine, Toaster, Iron & Ironing board, Washer & Dryer, Fridge & Freezer, Dishwasher. High quality Denon Receiver & Loud Speakers with Bluetooth for connection with mobile devices. The cottage is NOT suitable for heavy battery operated wheelchairs nor is the bathroom accessible for wheelchairs. PLEASE NOTE: We charge an additional $10 per night for uests who wish to charge an electric vehicle during their stay. We stayed at Kuona in Paso Robles for an unforgettable 7 nights. We loved Paso Robles and Clive was a font of information about places to go for wine tasting, restaurants and excursions. Karrin and Clive were both lovely hosts. The cottage we stayed in across from their beautiful home was a perfect combination of comfort and beauty in and out. We sat on the deck in the evenings unwinding and drinking wine and "drinking in the view" and then went inside to listen to music and make dinner in the very well equipped kitchen. The beds were comfortable with very nice linens and the bathroom has an unbelievable shower. We have stayed in dozens of VRBO's and this is without a doubt the Best Ever! We had an amazing three days and our only regret is that we did t have more time. Everything is comfortable, clean and easy to use! Thanks Nicole, we are so glad that your whole family enjoyed your Christmas stay at Kuona. Come back in the summer or fall when the weather is warmer and you get to enjoy all the outdoor delights of Kuona and the Central Coast. Only 15 minuets from downtown Paso Robles and dozens of wineries. Very well equipped cottage with modern appliances, comfortable beds and stunning views. I spent the mornings on the patio sipping fresh coffee roasted by the hosts. The surrounding hills were covered with alternating vineyards and horses. Deer and birds visited at dusk and dawn. A truly relaxing week. I didn’t want to leave! So pleased you found what you wanted. We love having guests who stay a little longer, especially when they are choosing to stay in a private guest house when away from home for work, instead of an impersonal hotel room. Having your family join you for the weekend was a great idea. Thanks for the great review. We look forward to seeing you again. We had an incredible stay at Kuona Cottage. Clive was a wonderful host. The house is perfect-from the spacious back deck, which we spent a lot of time on just talking and having a glass of wine watching the sunset to the charm and coziness of the house. Could not have asked for a better stay. We definitely will be back. Megan, I have just noticed that it looks like I didn't get back to you for such a kind and thoughtful review. How rude of me and I apologise profusely. We enjoyed that you found the property so peaceful and comfortable. Please do come back soon....the wet winter has made the area even more beautiful and serene. Absolutely gorgeous property, perfect place to relax and explore the central coast. Clive is an amazing host, I will definitely be back. Thanks for the kind words. We're delighted you enjoyed your stay, making the most of our local craft breweries in the area, and also making the most of the peace and quiet of our property. We forward to welcoming you again to this special part of the planet. Thank you for your kind words. We try to make Kuona a home away from home with a few added luxuries to make sure you never forget you're on vacation. I'm sorry we couldn't be there to greet your personally, although Fred is perhaps an ideal substitute! He and his wife lived at Kuona while they built their home, so he knows how to make the most of the home and how to find it! Come back and stay again a little longer next time.